The death of Edward Kennedy was undeniably a big political story, but the five days of intense media coverage also exposed how journalists see the Senator's ardent liberal agenda as an unquestionable good for America, not as controversial policies that fueled high-tax big government at the expense of the free market. Reporters painted Kennedy as Mother Teresa. "Over five decades, Ted Kennedy carried the torch passed on by his brothers, for civil rights, for the poor, and for the sick," CBS's Harry Smith opened The Early Show on August 26, just hours after Kennedy's passing. "For nearly half a century in the Senate, Ted Kennedy spoke for the people who had no voice — the poor and the disabled, children and the elderly," anchor Katie Couric echoed on that night's CBS Evening News. On ABC's Good Morning America the next day, viewers saw a scrolling list of laws Kennedy worked on. Reporter John Berman touted the Senator's role: "If you're in a wheelchair, that ramp is thanks to Ted Kennedy. If you earn the minimum wage, you make more because of Ted Kennedy." NPR's Nina Totenberg set the media template when she claimed Kennedy's liberal laws were adequate "redemption" for his personal vices: "He'll be remembered as a truly Shakespearean figure: tragic, flawed; who in the end achieved redemption through greatness — both in his personal life and in his professional life, and did enormous things for millions and millions of people." 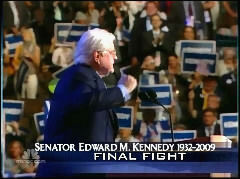 Over on CBS's Face the Nation on Sunday, Bob Schieffer saluted Kennedy as "the classic American hero." Absent from the journalist tributes was any real debate about whether Kennedy's liberal approach — enlarged government, higher taxes, increased dependency — was on balance more detrimental to America. In contrast, when Ronald Reagan died in 2004, the largely-respectful coverage included numerous liberal counterpoints. ABC's Peter Jennings, for example, transmitted the liberal cliche that "a great many people thought he'd made the wealthy wealthier and had not improved life particularly for the middle class." Sam Donaldson opined that while personally friendly, Reagan "the ideologue" would throw "your kids off school lunch program, maybe your parents off Social Security." With Kennedy, journalists eagerly hoped for one more liberal victory. "There's already an e-mail circulating that I've received today that reads simply, ‘In lieu of flowers, pass health care reform,'" NBC's Williams related. CBS News consultant Douglas Brinkley suggested there would be "a martyr syndrome" that "may help push this Obama plan through." After the tributes, NBC's Tom Brokaw declared the public now had a better understanding of Kennedy. Wrapping up his coverage Saturday, Brokaw proclaimed: "In the last 48 hours, the American people have had a more intimate look at Senator Edward Kennedy who, for so many years, was a kind of a caricature for so many people. But they've learned about his generosity, about his passion for public life." But in many ways, the media caricatured themselves last week. Kennedy's passing should have sparked a serious debate about his controversial liberal legacy. But star-struck reporters sought only to praise it.